A 2-inch diameter flat liquid mirror. It is made of an ionic liquid coated with a thin layer of silver. The reflection of a resolution chart is visible in the liquid. Scientists have successfully coated a liquid surface with a thin layer of silver metal, creating a highly reflective mirror that could be used to create mammoth liquid-mirror telescopes on the moon. Such a lunar observatory could be as wide as football a field, letting scientists peer back to a time when the first stars in the universe were born. Researchers led by Ermanno Borra of Laval University in Quebec, Canada, applied the silver film layer to the surface of an ionic liquid, a fluid that consists only of charged particles called “ions.” Table salt, if heated above 1,472 degrees Fahrenheit (800 degrees Celsius), melts and transforms into an ionic liquid. The technique is detailed in the June 20 issue of the journal Nature. 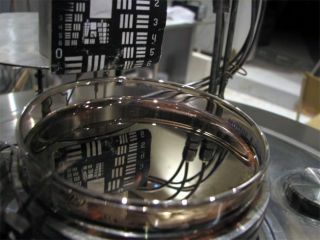 The new silvered liquid remained stable for months, did not evaporate in a vacuum, and its reflectivity rivaled that of the best metal-coated mirrors. All of these properties, the scientists say, make metallized ionic liquids ideal for use as the lens in a proposed lunar liquid mirror telescope, or LMT, a project currently under consideration by NASA. Borra and Roger Angel, an astronomer at the University of Arizona who was also a co-author on the study, are major proponents of a lunar LMT, which they say could detect objects up to 1,000 times fainter than even the James Webb Space Telescope, a next-generation orbiting observatory set for launch in 2013. A lunar LMT would be powerful enough for scientists to spot ultraviolet radiation from the very first stars thought to illuminate the universe, they say. LMTs are much cheaper than glass-mirror telescopes. The 6-meter Large Zenith LMT at the University of British Columbia, which has a liquid mercury metal lens, cost $1 million to build. A comparable glass mirror telescope would cost an estimated $100 million. A lunar LMT would be much easier to transport to the moon and to assemble once there, its proponents say. The moon's advantage over Earth as an observing platform? No atmosphere to distort the incoming light. Whereas a glass mirror has to be tediously ground to the right lens shape, a LMT simply has to be rotated because a spinning fluid forms a bowl-shaped parabaloid perfect for collecting light. Current LMTs use liquid mercury or gallium for their mirrors. But this approach won’t work on the moon because the sub-zero temperatures there would freeze the liquid metals into useless solid lumps. In contrast, a spinning metal-coated ionic liquid could remain fluid and retain its parabola shape, Borra said. An ideal lunar LMT would have to emit very little radiation of its own. “To have that glow dim enough to observe these very, very faint objects, you need a very, very cold mirror,” Borra said. Scientists have to create a liquid lens that can remain fluid at temperatures as low as -220 degrees Fahrenheit (-140 degrees Celsius) if they want to build an infrared telescope on the moon. The new silver-coated ionic liquid only remains liquid down to about -144 degrees Fahrenheit (-98 degrees Celsius).